Rev. Samuel Hopkins, D.D. 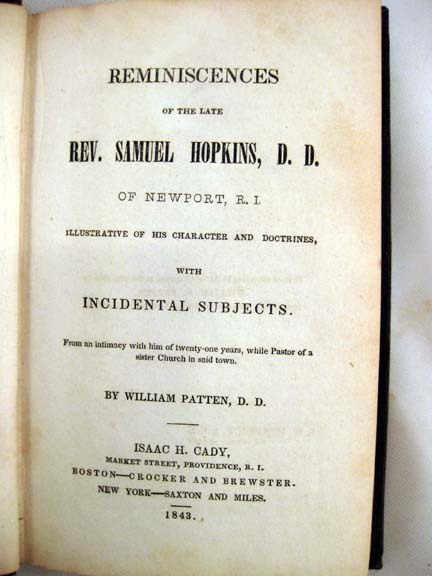 of Newport Reminiscences 1843. Item # RI 8. Titled: "Reminiscences of the late Rev. Samuel Hopkins, D.D. of Newport, R.I. Illustrative of his character and doctrines, with Incidental Subjects." Written by William Patten, D.D. Isaac H. Cady Market Street, Providence, R.I. Boston . . . etc. 1843. 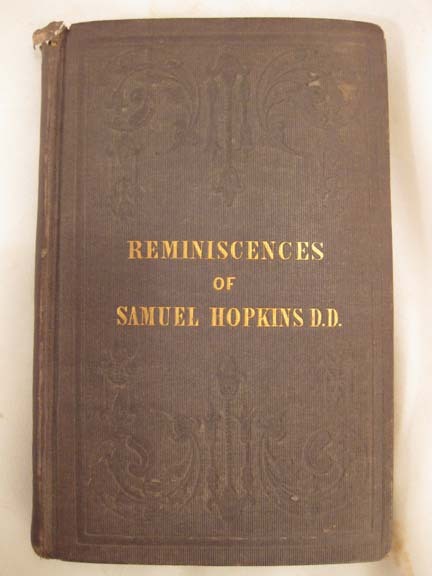 Samuel Hopkins was born September 17, 1721 and died December 20, 1803. He was an American Congregationalist minister of the late Colonial era. Created a new theological structure called The New Divinity also called Hopkinsianism. He is credited with originating the concept of "disinterested benevolence" which became and central concept in "The Great Awakening". An early opponent to the institution of slavey, he published a pamphlet entitled, "A Dialogue Concerning the Slavery of the Africans," which was addressed "To the Honorable Members of the Continental Congress, Representatives of the Thirteen United American Colonies." Size: app. 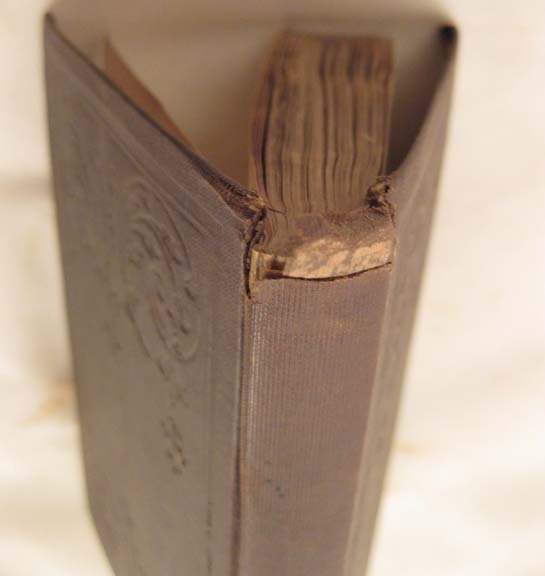 4" x 6"; condition: fraying to the top outerbinding, some foxing and a couple of tiny holes in a couple of pages. A good Rhode Island reverence book in usable condition. Price: $150.00. The Drawing Room is located at 152-154 Spring Street, Newport, Rhode Island 02840.We are open daily from 11 am to 5 pm and by appointment. If you have an interest in an item listed in this document or wish to purchase an item, please call us at 1-401-841-5060 (cell 1-401-261-3980). All images copyright by Federico Santi, 2009 / We are sorry if a book listed here is not available: we sell these books in our gallery and from time to time we update the listing on these pages.